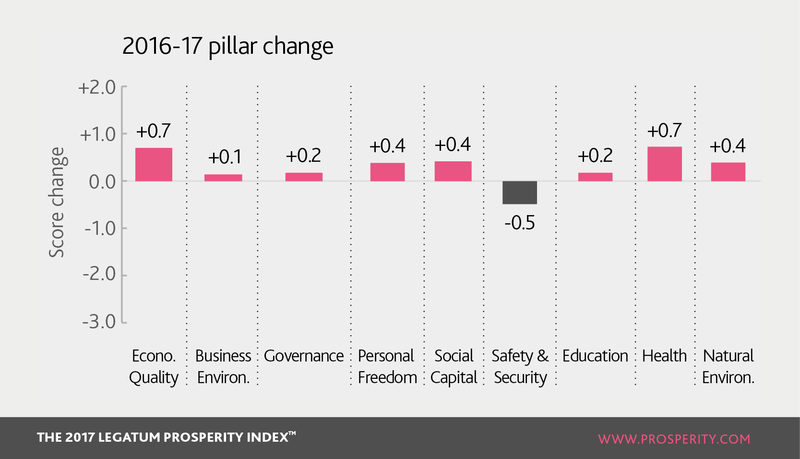 16 countries increased their prosperity in 2016-17 – and the biggest improvements in prosperity are concentrated outside of the top 10. For example, Honduras – ranked 81st globally – had the largest score increase. However, seven saw a decline. These include Ecuador, Venezuela, Nicaragua and El Salvador, which saw significant declines in prosperity. As a region, Latin America and the Caribbean outperforms world averages in both its level of Personal Freedom and the quality of its Natural Environment, but underperforms in areas such as Safety and Security, Governance, and Business Environment. Across the region, Personal Freedom, Economic Quality, and Health have all strengthened in aggregate this year. But losses in prosperity have come from declines in Safety and Security, while sharp declines were experienced by some countries in Governance. Despite a small increase in overall prosperity, Bolivia has seen its Governance score decline, driven by systemic problems with judicial independence, as well as increased difficulty in challenging regulations. Honduras saw the largest increase in Personal Freedom within the region, and the fourth-largest increase globally, driven primarily by increased satisfaction with levels of freedom in the country. Social Capital rose sharply in Ecuador, demonstrated by increases in donations and volunteering. Guatemala improved its performance in the Health pillar, driven by improved vaccination rates for measles. A suite of new environmental regulation and preservation schemes have improved Peru’s performance in the Natural Environment pillar. 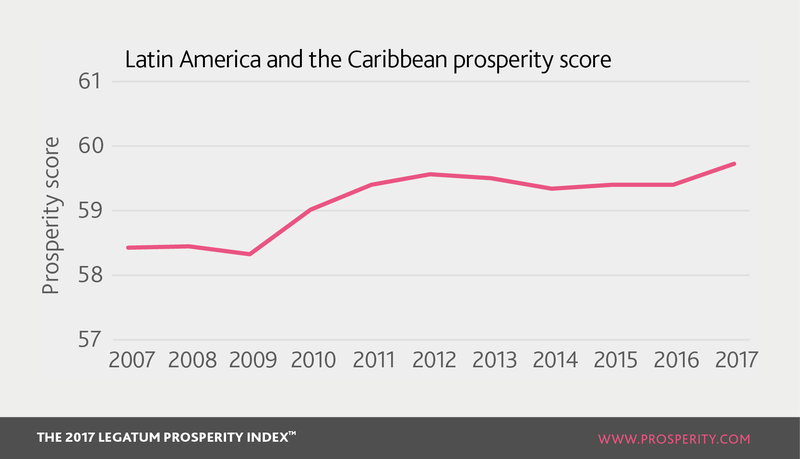 As a region, Latin America and the Caribbean has seen its prosperity grow this year. 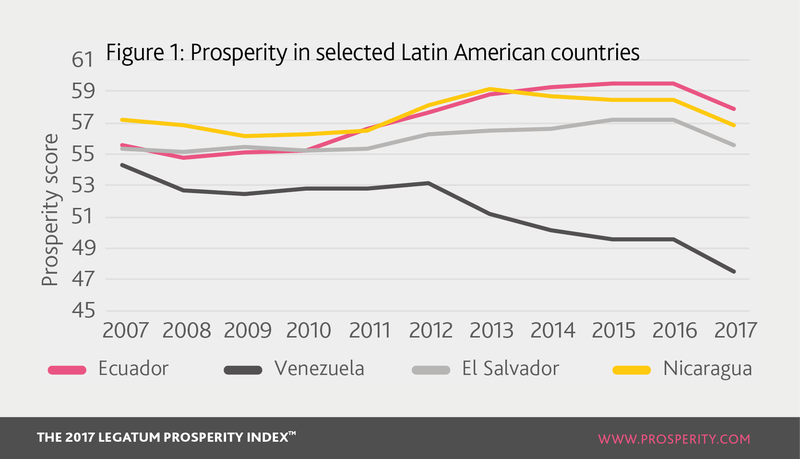 However, the average regional performance masks the fact that in 2016-17, prosperity dropped sharply in four countries: Venezuela, Nicaragua, Ecuador and El Salvador. The Prosperity Index shows that, whilst driven by many factors, all of these countries were held back by weaknesses in their Governance and also Safety and Security. The decline in their Governance standards illustrates a concerning trend. Whilst the underlying institutions of democracy ostensibly are operating, with three of the four countries having elections in 2016-17, the norms and values which normally underpin a democratic system are being eroded. This can be seen most clearly in Venezuela, where intimidation and suppression of opposition parties has been extensively reported on. It can also be seen in Nicaragua, where the Supreme Court was involved in the removal of the opposition leadership and free speech has been suppressed. Similarly, in Ecuador, Rafael Correa, the previous President, oversaw the erosion of judicial independence. The results of these policies can be seen in the Prosperity Index, with decreased Governance scores being caused by: reduced judicial independence; decreased efficiency of the legal system; reduced confidence in the rule of law; declining transparency in policymaking; and through increases in perceived levels of corruption. Across these five indicators and four countries, a total of 18 out of 20 possible indicators have decreased. Clearly, whilst formal democratic institutions exist and political participation is high, the system of governance is underperforming. This is because sound institutions require public trust and a commitment by all parties to operate within the same set of rules and norms. The relationship to prosperity is clear: democratic institutions are one of the key ways the public can steer their country, helping guide its policy priorities to the ones which improve their wellbeing, health, and status – away from ones which they view as damaging. When this link is undermined, governments often cling to power, and do not change course. In the worst circumstances, it represents the beginning of wider suppression and violence. The results show that almost across the board Venezuela, Nicaragua, Ecuador and El Salvador saw declines in the quality of their Education, Health, Safety and Security, and their Business Environment. Clearly it is not the case that a lack of democracy is being traded for better social outcomes, but rather that it is associated with a worsening situation for ordinary citizens. For prosperity in Latin America and the Caribbean, ‘soft’ institutions and the norms they require to function are as important as formal institutions and participation. Without them, people lack the ability to make policy work for themselves – and what follows is a loss of prosperity. What does this mean for the future? When faced with weakened institutions, there are two distinct routes which could be chosen: Venezuela’s, where the Government has doubled down with greater suppression and violence, which has drastically reduced prosperity; or Ecuador’s, where a new President has begun to take steps against corruption, which could lead the country to regaining its place in the regional top 10. There is a wide regional warning, which should be heeded quickly: more prosperous countries such as Bolivia and Chile have also seen drops in their Governance score. If the experience of their neighbours is anything to go by, this may represent the start of a much larger threat to their longer-term prosperity.